There exists in Bulgaria a rich choral tradition which sounds quite different from the Western classical vocal style. Characterised by its plain, penetrating vocal timbre (created, I’m told, by maintaining chest resonance up into the high register) and striking use of dissonant close intervals, this centuries-old folk style was popularised by Le Mystère des Voix Bulgares compilation album, the success of which has spawned a number of excellent Bulgarian female choirs operating in the same vein. Thanks to Strezov Sampling’s Rhodope 2 Ethnic Bulgarian Choir library, we can now experience this heart-stirring sound in the comfort of our own homes. Named after the remote river-crossed mountain range of southern Bulgaria, Rhodope 2 follows in the footsteps of Strezov’s Wotan, Freyja and Arva choirs, but where those choirs sing in a recognisably European style (albeit avoiding the dreaded ‘molto vibrato’ wobble), this library features the distinctly non-classical sound of all 20 members of the Cosmic Voices Bulgarian female choir singing in unison over a two-octave E3 to E5 range. The format is identical to that of Strezov’s choir trilogy: ‘ah’ and ‘eh’ polyphonic true legato patches allow joined-up melody lines and chords to be combined within the same performance, while 10 syllables (‘tul’, ‘day’, ‘tip’, ‘lor’, ‘han’, ‘mir’, ‘ket’, ‘yon’, ‘zey’ and ‘yul’) can be arranged into custom lyric sequences which may be stored and recalled. In addition, the choir performs shouts, whispers and a small collection of eerie, atmospheric cluster chords, risers and falls, including a sensational long slide down on the sound ‘eeh’. Using the ‘Syllabuilder’ patch’s dashboard, you can assemble syllables in your desired order and connect or morph between them to create compound sounds. The syllables’ sound can be drastically customised: the final consonant (which in some cases is performed as a nice falsetto yelp) may be removed by turning off the release samples, and the ‘start offset’ control used to trim note fronts, thereby transforming (say) ‘tip’ into the vowel ‘eeh’. Syllables are performed at two dynamics in a choice of sustain and staccato (the latter good for rhythmic passages), with a third layer of dramatic, ululating ‘shake’ performances kicking in when you push up the mod wheel. This 4.11GB library contains no sung phrases; all sustains are looped, the tuning is immaculate and the dynamic range is huge. Most importantly, the singers sound great. To my ears, their unaffected delivery is a breath of fresh air, bringing the magical sound of the traditional Bulgarian female choir to the wider digital world. Strezov Sampling’s second Bulgaria-themed offering, Balkan Ethnic Orchestra, focuses on multisampled instruments played in authentic style, including some pretty wild articulations which George Strezov admits were hard to pin down in sampled form. The library (28.6GB installed) has five main categories: ethnic, band, percussion, pads and a four-piece female choir whose performances and style match the content of Rhodope 2. BEO includes stringed instruments I’ve not come across before in a sample library. One such gem is the gadulka, a vertically held bowed fiddle which gets its resonant tone from sympathetic strings positioned underneath the melody strings. Three gadulka players perform sinuous true legato sustains, short notes, staccatos, pizzicatos, slides, cluster chords, risers, falls, and a few single-note tempo-sync’ed rhythm patterns; most of these styles are duplicated by a solo gadulka player, who also plays some nice tremolos. In a similar vein, the Macedonian kemane is an unsophisticated folk fiddle whose keening timbre and melodic ornamentation suggests an Arabic influence. Other stringed instruments include a passionate-sounding, full-bodied ‘gypsy romantic violin’ and a second gypsy violin player whose mad, harmonic-rich trill-based bowing style would soon nip any romance in the bud. For accompaniment, you can use the tamboura (not to be confused with the similarly named Indian drone instrument), a rich-toned, long-necked fretted lute which plays a nice set of fifths chords and single notes. Moving on to wind instruments, the highly expressive, breathy, plaintive voice-like tone of the alto duduk is a beautiful texture — I could play this thing all day. By contrast, the Bulgarian shepherd duduks’ high-pitched, overblown squeals sound somewhat unmusical (though the sheep are said to enjoy them). Normal service is resumed by a confident solo clarinet and a pair of tuneful kaval wooden flutes, whose simple folksy tone, elegant grace notes and flutter-tongue improvs will grace all manner of soundtracks. The insanely loud, shawm-like zourna and goat-skin gaida bagpipes (which plays ornamented legatos, bass drones and some fine pre-recorded phrases) are also tremendous, exotic-sounding timbres, but tread carefully, overuse of these piercing sonorities can break up marriages. The band section houses more familiar-sounding instruments, including one of the nicest accordions I’ve heard, plucked double bass, acoustic guitar single notes and chords (played short for rhythmic accompaniment) and a brass section of trumpet, flugelhorn, two trombones, euphonium and tuba solo instruments. Barring the odd wobbly trumpet low note, the brass sounds strong, and its tight, smartly played staccatos are impressive. If anyone feels we’re drifting into orchestral territory here, a quick blast on the clarinet or trumpet’s expressive, ornamented vibrato style reminds us we’re in the Balkan Peninsula rather than the Royal Albert Hall. Underpinning this melodic smorgasbord is a comprehensive percussion set comprising a basic danceband-style drum kit with no crash cymbals, tupan and darbuka ethnic drums, whistling, claps, shouts, large klepalo woodblocks and set of outsize ‘chan’ cowbells, all played in various styles and presented in 12 user-assignable play zones. There’s also a good, if slightly incongruous, collection of spacy sound design-style pads, many of which incorporate a fabulous built-in huge, low ethnic drum hit. Clearly a labour of love, this colourful, hugely versatile library has applications beyond its specialist field. Both libraries were recorded from multiple mic positions in the Sofia Session Studio. 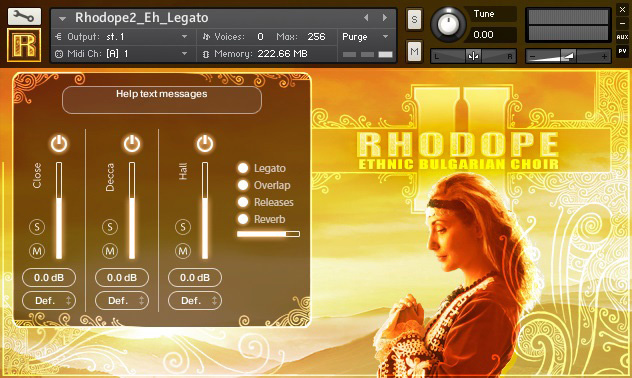 Rhodope 2 requires the full version of Kontakt 5+ with the free Kontakt Player not supported, while BEO runs on both Kontakt Player and full Kontakt version 5.7.1. Rhodope 2 €299, Balkan Ethnic Orchestra €339.Rhodope 2 $279, Balkan Ethnic Orchestra $349.